How to draw the bow between environmental protection and economic efficiency? When developing and industrialize the CYTOCLEAN® - process for biological clean-up of oiled surfaces, we have successful combined environmental-protection and cost-saving, two characteristics that naturally do not combine. The clean-up of oiled surfaces by application of biological and non-toxic CYTOCLEAN® is an active contribution of environmental protection. The significant reducing of direct costs for clean-up of shiptanks, shoretanks and other mobile tanks, pipelines and oiled equipment by the CYTOCLEAN® - process enables our customers to protect the environment and save costs at the same time. when it has to be burned. - does not require any chemical or mechanical process that harms water and air. ist „regular circle“ without any chemical treatment. 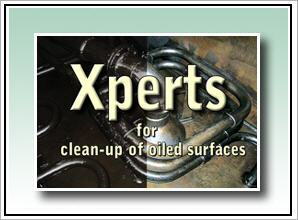 In times of high energy costs, ever increasing pollution of the environment and steady rising costs of hazardous waste disposal – the CYTOCLEAN® - Process ensures a impressive and convincing way to cleanup oiled surfaces, tanks, pipes and equipment in an environmental friendly and competitive way. The bow between environmental protection and economic efficiency has been dawn.